If you are into Japanese trends and culture then you are sure to have heard of One Piece which is currently the biggest manga (comic) in the country, selling a ridiculous amount of volumes and spawning a long running TV anime. 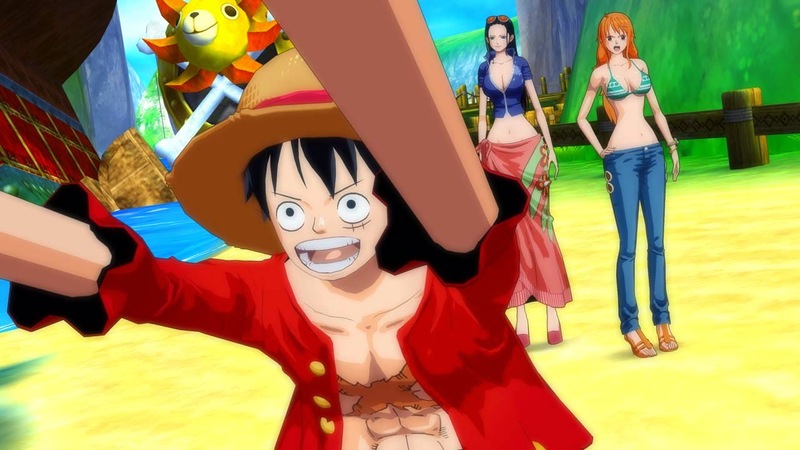 Along with other bits of media, videogames have been explored as well with the latest one called One Piece: Unlimited World Red, but how does it fair? 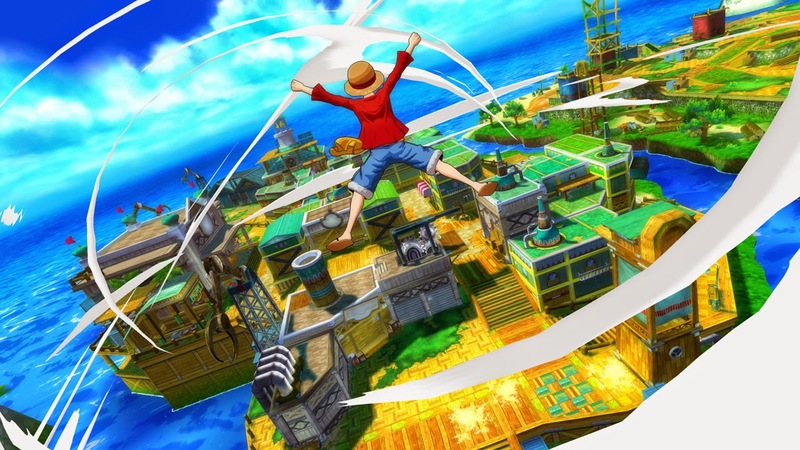 One Piece: Unlimited World Red's main story follows Luffy and the Straw Hat Pirates to a new island, upon landing there to get their fill of land life for a while, the crew all disappear leaving Luffy to wander the town looking for everyone. 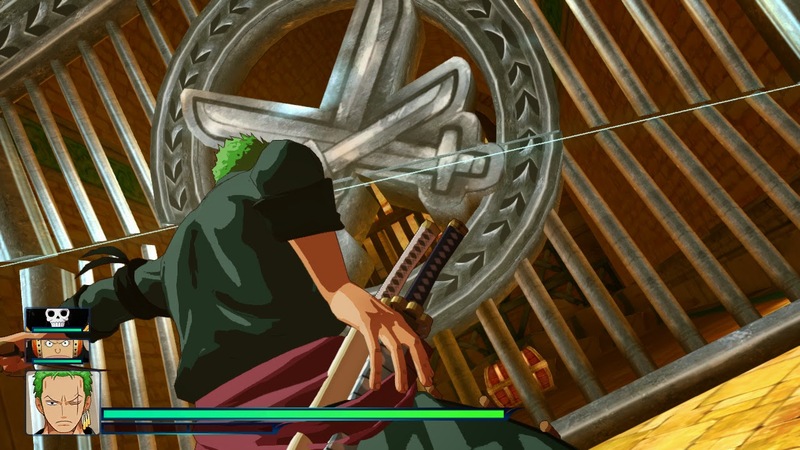 Things on the island appear to be very strange as Luffy travels to places he's already been before in his travels and do battle with old enemies to find his missing shipmates. Once everyone is brought back together, it's revealed that Red the Aloof is behind all the strange events occurring. Luffy, Robin and Nami with the Sunny Go in the back. As well as the main story mode there's also a second mode called Battle Coliseum, which gets rid of the whole hub world and just throws you into a variety of different arena style battles. There's a story in this mode as well, but it’s pretty bare bones, the gist of it being that you're entered into a tournament and must rise through the ranks by defeating lots and lots of enemies. This is all based around the current manga/anime story arc and features a much larger roster of characters to unlock as you progress through the game. Things you unlock in Battle Coliseum can also cross over into the main story. Depending on which game mode you play, you'll have one of two experiences; the main story mode has you walking around Transtown, a small run down village full of people that want your help. When you're not in the town, you're exploring a large variety of themed areas and fighting off other pirates, mermen, soldiers, sailors, weird animal people and pretty much anything else you can think of. Oh they'll be a lot of fighting... believe me. As well as all the punching and kicking you can do, there's also town development. Part way into the story your host that's letting you stay in her hotel for free asks that you gather materials while you're out adventuring to rebuild the town to its former glory. As you develop the town, you get access to power ups and other items that you can't just find while wandering around. You can also expand the town which in turn gives you even more to explore. If all this sounds like too much hard work, you can opt for Battle Coliseum, it gets rid of all the exploring aspects and has you just fighting enemies, be that one on one fights or battling huge hordes of weaker enemies. There are also special types of fights where you have to use set combatants in order to progress. Controls for the game are very simplistic, X and Y are your main attack buttons, B is jump and A is used for evading and blocking. Prompts will pop up on screen when someone is about to attack you and depending on how quick your thumb speed is, it affects what action you perform. As well as regular fighting combat, you can also shout out words, not actually shout them though, you either tap or hold the R button to issue commands which can affect you such as powering you up or healing yourself and teammates, to getting your fellow pirates to do co-ordinated attacks for massive damage. The visuals have stayed true to the original source material, opting for the now fairly common cel shading style. Cutscenes are pretty impressive when they actually play, sometimes rather than a full video you get some dialogue boxes with whoever is talking just standing at the side of the screen. Character models have been well recreated and their fighting moves are all pretty faithful to the original series, along with this the voices are also done with original Japanese actors giving a good link with the anime counterpart. Visuals staying true to the anime. 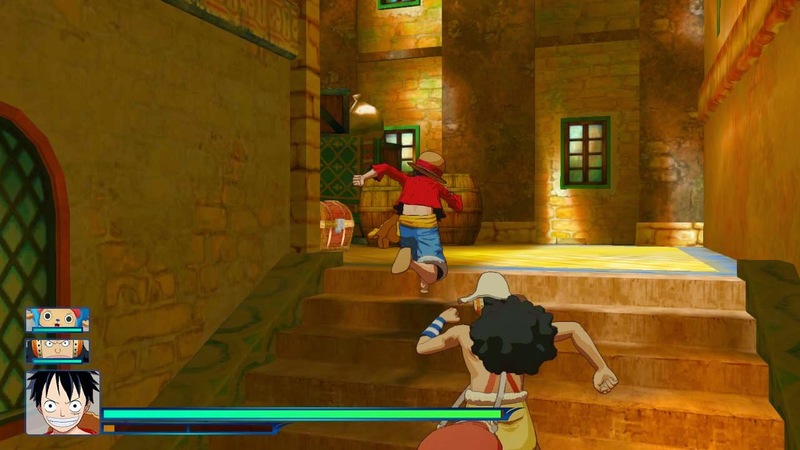 My own issue with the graphics is in the environments, a lot of them are fairly bare and the town design seems very cramped, unless you're using Luffy's stretch ability to grab the edges of buildings to jump around on the rooftops, the narrow streets can feel very cramped and make the camera go a bit strange. If you've never seen One Piece before, this probably isn't going to make much sense because everything in One Piece is really weird, however if you have, it's a huge love letter to fans of the series what with all the detail and polish that's been deployed. Short of this though, the game can become very repetitive despite the fairly sizable roster of playable characters, it all tends to just boil down to smacking 2 buttons and hoping that enemies die quicker than you do.